When a new page opens, click the "Download” bar for Apple iOS. Click “Install” to download the app. 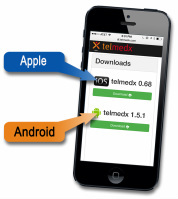 The app will load and the telvuex logo and name will appear on your device's home screen. Tap on the app to open it. Read the End User License Agreement (EULA) and click “Accept” if you agree to its terms, or contact us if you have any questions. There is no obligation to pay money in this EULA. To complete the setup and deliver live video and photos from your device to a Web browser, please contact Clint Carney at ccarney@telvuex.com. Note: The app has a Pause button and a Play button to stop and start the video as needed. Type this address into the Internet browser on your phone or tablet: telvuex.com/app. When a new page opens, click the “Download” bar for Android. Click “Install” in the next window that appears asking if you want to download the app (you may need to adjust the Settings on your phone to allow outside applications. To do this, open Settings, click on Security, and then check the box to download from Unknown Sources). Click on the button titled Verify and Install, and then click on the button titled Just Once. Next, click Accept and then click Open. Open the app and hold the phone so the high-resolution back camera is focused on the area to be shown in the live video feed. Keep the camera three inches or more away from the area to be viewed. This allows auto-focus to function more easily. Move the camera slowly and deliberately to allow auto-focus to function properly. Begin a phone conversation with the person who will deliver the live video feed. Open a Web browser on your computer or tablet - Google Chrome, Firefox, Safari, Opera or Internet Explorer 10 or newer. Click on the name of the mobile device that will be the video source for your session. Ask the person with the mobile device to open the app. Live video will be displayed on the left side of the browser, and the right side will display high-resolution still photos. Multiple experts in different locations can view the same live video at the same time, and each doctor can independently take their own photos. Each expert uses the same login information to connect to the same mobile phone or tablet. To take a photo from a Web browser, click on the orange camera button next to the words Take Photo. Still photos appear on the right side of the screen while the video continues. Thumbnail images appear below the video screen. To save a photo, simply right-click on either the large photo or the smaller thumbnail and select "Save As" to save the JPG in a location or file of your choice. NOTE: No photos or video are saved on mobile devices or on the telvuex server. Photos can only be saved on the Viewer / Web browser end of the platform. Unless saved by the Viewer, all still photos disappear and cease to exist when the browser is either refreshed or closed.